Home Your Individual Health Interests and Concerns C60 Greatest Supplement Discovery What is C60? C60 is also known as Bucky Balls and as Fullerenes and as Buckminster Fullerenes. C60 was named after Buckminster Fuller, the architect of the geodesic dome structure, which was the centerpiece of the Expo 1967 exhibition in Montreal. C60 is short for Carbon-60. C60 has 60 carbon atoms, and no other atoms. C60 is made of pure carbon. For centuries, it was believed that pure carbon existed only in two forms, diamond and graphite. However, in 1985, a new form of pure carbon was discovered, a form with a remarkable structure. Diamond, graphite and C60 are all made of pure carbon. The only difference is the structure. Diamond is carbon in a tetrahedral structure, which is the tightest, most compact structure possible, therefore hardest substance known. Graphite has a structure of layered hexagonal planes, sorta like a hexagonal tile floor with another layer of tile on top and another layer, millions of layers. C60 is a third form of carbon. 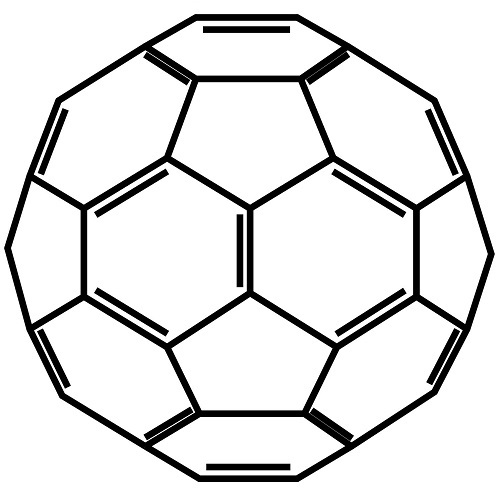 The structure of C60 is a little like the hexagonal plane of graphite, but the carbon atoms in C60 are arranged in a combination of hexagons and pentagons, exactly like a soccer ball. When there are 60 carbon atoms, the spherical shape closes itself off to create a form exactly like a soccer ball. This structure is called a Bucky Ball or a Fullerene, also known as C60.